Take Your Practice the Next Level! Many obstacles prevent hearing aid clinics and audiology practices from realizing their full potential. The hearing healthcare industry is an increasingly competitive landscape and poor performance can quickly become a significant gap in your business. Identifying the best ways to drive performance in your practice can be a daunting task. It can be hard to know where to start, or where you can have the most impact. amg network is here to help. Our Practice Performance Model identifies the constraints in your business that are limiting performance excellence and puts easy-to-implement plans in place to bridge the gaps. By leveraging our expertise, you and your team are free to dedicate your resources to delivering best-in-class patient care. What Is the Practice Performance Model? Our proprietary Practice Performance Model uses the power of patients to drive your success. By increasing patient-satisfaction we increase your selling opportunities, allowing your practice to thrive along with your patients. 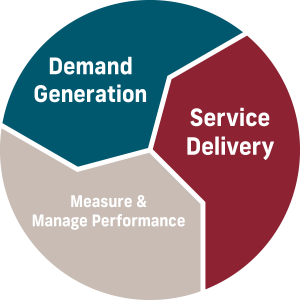 amg network’s Practice Performance Model is a wheel that powers continuous improvement within your business. As the wheel spins, three drivers create momentum. Within each of the three drivers of performance there is the potential for gaps in the patient experience. By addressing the gaps, we fuel the wheel to ensure power performance in your practice. Driver 1 – Demand Generation: To thrive, every practice needs to attract new patients. We deliver the strategy, tools and support services that you need to position your practice as a leading healthcare provider in your community, increasing sales opportunities. Patient referrals are an excellent source of new patients. Our focus on patient engagement ensures that word of mouth is leveraged to drive your practice’s success. Driver 2 – Service Delivery: Failures in service delivery can be a major business constraint, even when new patients are regularly coming through your door. From patient financing to staffing, we provide you with the solutions you need to streamline the patient process. Excellence in service delivery ensures maximum satisfaction, increasing your sales and keeping patients coming back. We work with you to develop a comprehensive selling strategy that starts before the patient even walks through your door. We share techniques that help your team to proactively inform patients, ensuring that they enjoy a straight-forward and rewarding purchasing experience. Driver 3-–Measuring & Managing Performance: Effectively setting measures and monitoring performance against them is an essential part of running a successful practice. But it can be hard to know what best-in-class looks like. amg network’s expertise helps you set meaningful KPIs so you can ensure you’re on track as you drive towards your strategic goals. Whether you need a compensation package that attracts and retains key talent and drives towards sales targets or you want to build an exit roadmap for your retirement, amg network puts easy-to-implement plans in place that ensure progress towards your goals are measured every step of the way. The Practice Performance Model is a wheel designed to drive continuous improvement. As one gap constraining your business is bridged, the next gap is identified and a roadmap to address the constraint is put in place. In this way, the Practice Performance Model creates momentum that continuously powers your practice to new levels of performance. There is a reason audiology practices nationwide trust us to handle their business and marketing concerns. When you become an amg™ member practice, We Do the Work, You Take Care of the Patient!™ Call us today at 866-566-7705 or fill out the online contact form on this page to have our team create a custom business plan based on your individual needs.